Texas is becoming more well known for their wine production. Local wineries have helped Texas become fifth on the nation’s list of top wine producers. These wineries include Becker Vineyards, Comfort Cellars Winery, Fredericksburg Winery and Grape Creek Vineyards, all with their lists of many awards. 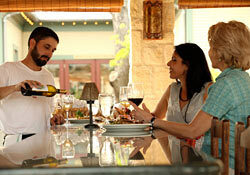 The Texas wineries in the Hill Country have a large choice of wines to offer. Other popular wineries in the area include Bell Mountain Vineyards, Oberhof Winery, Woodrose Winery and Torre Di Pietra Winery. These Texas Wineries host tastings of newly released wines during the year along with wine and food pairings, seminars, demonstrations, and tours. Come and meet the vintners as you tour and taste. For more information about these events call 1-866-621-9463 or check the website. After sampling some wonderful wine from the local vineyards check out some of our Fredericksburg Texas shops to find a keepsake to take home. While making your plans to visit a local winery, choose from our variety of Hill Country lodging options including Fredericksburg, Comfort, Kerrville, and Hunt. You can also book a Majesty Wine Tour.